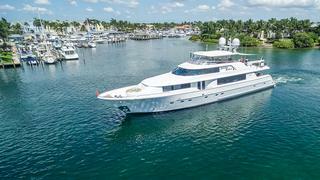 The 31.1 metre (112’) motor yacht Something Southern has joined the Ocean Independence charter fleet in Florida and the Bahamas, and is offering a special introductory rate of $47,000 per week, down from $49,000 per week, until October 31st. Built in GRP by US yard Westport and delivered in 2002 as one of the yard’s popular 112’ models, she was refitted in 2013 to receive all the latest state of the art entertainment facilities. Accommodation is for eight guests in four cabins consisting of a master suite, VIP suite a double and a twin, all with en suite showers, while the master suite has a separate tub. The saloon is large and features dark wood joinery contrasting with light coloured soft furnishings, panoramic windows, comfortable seating, a bar and a sophisticated entertainment centre including a 65 inch flat screen television, with a formal dining area forward. The shaded aft deck is fully fitted out for al fresco dining and entertaining with upholstered chairs and bench seating around two matching teak tables. Entirely private sunbathing is offered on the foredeck, complete with crescent shaped seating. The flybridge is one of the highlights of this yacht for charter, with a bar, bar stools, sociable seating areas, sun loungers, a Jacuzzi and awnings providing welcome shade from the heat of the sun. Something Southern is also listed for sale. Water toys include a new tender, two new SeaDoo Waverunners. Two SeaDoo underwater scooters, spear fishing gear, snorkeling gear, scuba diving equipment, a dive compressor, fishing tackle and a range of towables, including water skis.